My children are like oversized sponges. They soak up knowledge and retain it in a way that my brain is no longer capable of. At least, they do if it is something they are interested in. If it is knowledge related to good table manners my children are rather like sieves. But, the point is, get them interested in something and they lap it up. They want to know everything and anything related to it. So perhaps you can start to see the potential for teaching with picture books. Engage your child in an absorbing picture book, and then use that book to slip in a few teaching moments with your captive audience to improve their reading comprehension skills. There are some fantastic picture books out there on every imaginable subject with gorgeous illustrations and riveting text, that cannot fail to enthral your child. Capture that moment and turn their engagement into a learning opportunity. A teaching moment can be as simple as asking questions and starting a conversation about what you are reading. 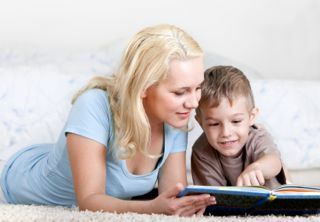 Focus on helping to deepen your child's understanding of what they are reading. Encourage them to use a combination of reading strategies to enable them to process the words and ideas they come across. You can find details here of each of the five key reading strategies of making connections, asking questions, visualising, inferring and summarising, together with examples of using these strategies with specific children's books. Teaching with picture books in this way requires very little preparation and can be fitted around your regular reading times. Alternatively, teaching with picture books can involve having fun with more structured picture books activities. I find these work particularly effectively with my two hyperactive boys. Conversations are all very well, but to engage my children for longer they need to be actually doing something. The images in picture books are perfect for sparking your child's imagination and prompting them to want to find out more. Most picture books are reasonably short and so you still have time to fit in an activity around it without your child losing concentration. Also, by using books to teach your child, you are starting to introduce the idea that books are for learning. Below you can find some examples of picture book activities to do with your child which will help to improve their reading comprehension skills. My children and I have had fun with each of these activities and if you follow the links you will find all the details of what we did. You too can be teaching with picture books before you know it! This is one of my favourite books to read aloud at Christmas or, in fact, any time of the year. It is an amusing story, told in classic Dr. Seuss rhymes, and provides a great way to get your child to think about the real meaning of Christmas. No, it's not just all about presents! Find out how we used this book to create a simple kid's comic - a great way to practice summarising and sequencing the events in a story. This is one of the most popular children's picture books ever written. On the one hand it is a simple story about the enduring friendship between a boy and a tree. However, as you dig deeper you discover many complex themes woven into the text. Check out these ideas and activities for exploring some of the themes introduced by the book with your child. Stellaluna is a charming picture book about a baby fruit bat who gets separated from her mother and ends up in a nest of friendly baby birds. It is a touching story which also offers a host of learning opportunities for your child such as storytelling, figurative language and improving literacy skills with a bat crossword. Factual books are perfect for building background knowledge, which is so important in helping your child to become a competent reader. The issue can sometimes be trying to assimilate all this great knowledge. Here is an activity which we enjoy playing when reading non-fiction books and which helps my children absorb more of what they are reading about. In this activity we drew maps of Mr McGregor's garden, the scene of Beatrix Potter's classic story "The Tale of Peter Rabbit". Creating a map can help children to gain a clearer sense of the setting, engage more deeply with the plot and absorb more successfully the essential details of the story. For such a small and simply drawn monkey, Curious George has a very expressive face which reflects a range of different emotions as his adventures unfold. These expert illustrations by H.A. Rey are perfect for showing children how to connect more closely with characters in books and specifically to explore the emotions a character is feeling. Connecting through play with "Where The Wild Things Are"
Good readers think actively as they read and make connections with what they are reading. Re-telling a story helps a child to make connections. In this activity my children re-told the story in the popular book "Where the Wild Things Are" with a bit of help from Gormiti figures, which made perfect Wild Things! I hope you have fun with these activities and enjoy teaching with picture books. If you enjoy teaching with picture books, find out what other literacy activities for early readers are most popular with visitors of this site.